Old Englsih – Under the influence! Beowulf is an epic poem originally written in Old English about a mythical warrior who epitomised the perfect warrior qualities of courage, honesty, loyalty and strength. This work is a brief synopsis of the poem. The story begins with the funeral of the great King Scyld of Denmark and ends with his own. King Scyld’s great-grandson and successor King Hrothgar builds a great and luxurious hall for his warriors to live in and he names it Heorot. When the hall has been completed King Hrothgar hosts a great and lavish feast and all his warriors gather there to celebrate. Unknown to the king or his warriors the noise of their celebrations has awoken Grendel, a monster whose lair is at the bottom of a nearby lake. 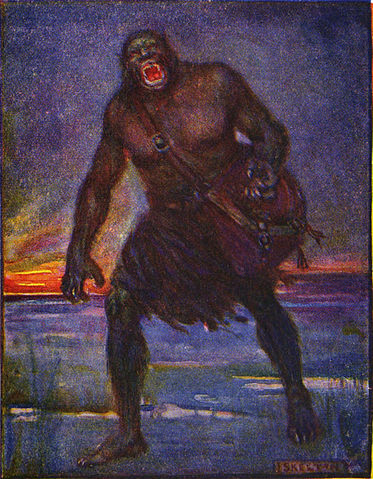 Grendel raids the hall one night killing thirty of the king’s best warriors while they sleep. Each time the hall is used for feasting over the next 12 years Grendel appears and kills great number of warriors. King Hrothgar and his best advisers can find no way of ridding themselves of Grendel or a way to assuage his anger.